Wouldn’t it be nice if you could give someone an extra hour in the day to get things done? Unfortunately, it is not possible to do precisely that, but the following list contains gift ideas that can help people manage their time better and be a little bit more productive. A good night’s sleep allows for a more productive day. For those who live in noisy environments, Alpine SleepSoft Earplugs can block out noise and allow deep restful sleep. For shift workers or those who sleep late, blackout curtains can make all the difference in the world. Installing them in children’s bedrooms may encourage them to sleep later, too, giving parents an extra hour in the morning or evening to get some work done. 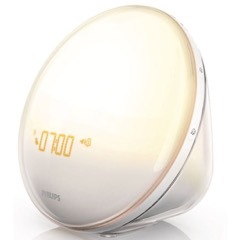 For those who have trouble getting started in the morning, the Philips Wake-Up Light Alarm Clock (pictured below) gradually increases the light level so you wake up naturally and feel energized and productive throughout the day. There are three great books that I recommend to boost organization and productivity. 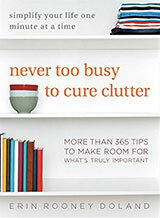 Erin Doland’s book Unclutter your life in one week is a straightforward place to start to get your home in order. An orderly home reduces stress and less stress helps you focus on those things that really matter. 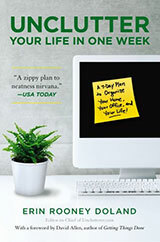 57 Secrets for Organizing Your Small Business by Julie Bestry is a great book, not only for small business owners but also for anyone who wants to improve their level of organizing and productivity at work or in the home office. It is full of tips and tricks that will save time and money. Effectively managing many tasks with different priorities and deadlines is essential, so I recommend the book On Top of Everything by Laurence Seton. The book describes an easy way to learn a task management system called “Projecteze®.” I mentioned this book last year and I’m happy to recommend it again because the system is just so simple to use. Highly productive people usually carry a notebook. 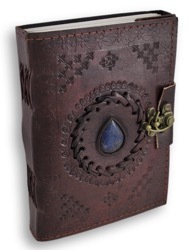 Notebooks allow them to keep their lists and all of their brilliant ideas in one place. And, with the hectic pace of life, notebooks are often more reliable than one’s memory. Fellow Unclutterer Dave says one of his favourite notebooks is the Hobonichi Techno. I quite like the Staples™ ARC customizable notebook system because of the ability to add different types of pages (calendar, contacts, etc.) according to your requirements. The Michael Roger “Decomposition” Book is a great basic notebook made from 100 per cent post consumer waste. For the person who seems to have everything except enough time to work on his or her projects, perhaps the best gift would be to offer an uninterrupted block of time. Offer to assist homeowners in completing an outstanding DIY project or mind young children for a few hours while parents complete a project. Feel welcome to explore our past Guides for even more ideas: 2007, 2008, 2009, 2010, 2011, 2012, and 2013. Isn’t the correct gift to give/receive for/from an unclutterer the always helpful Nothing At All? 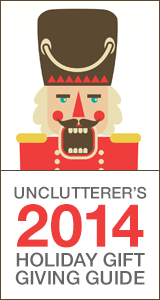 @Paul — Nothing at all would be a minimalist gift, not an uncluttered gift. And, I imagine a young child or grandmother or dear uncle might feel slighted if you didn’t give them anything for a celebratory event (unless that is what he/she specifically requested). My children would likely call grandma and grandpa crying if there were nothing at all to open on Christmas morning. Nothing at all would not be a gift: it would be nothing. Good comfortable industrial earplugs for sleep can be had for far less than $30, which leaves the possibility open for several pairs. Try an auto parts store or the Howard Leight website. Do not purchase the Dollar General Howard Leights, which are stiff, uncomfortable, and don’t live up to their 32 rating. Also bad: drugstore earplugs, which fall out by morning and block little noise. The Dollar Stretcher has one of the most innovative gift ideas I’ve ever seen: the love jar. This probably could be done with a vase or perfume bottle for the upscale. Check it out at their site: stretcher.com. Thank you @Erin, you have clarified things nicely. I see that I have mentally moved down the road from uncluttered (well-arranged stuff) to minimalist (no stuff at all) as my preferred mode of being. Stop consuming, and things get cleaner and neater almost all by themselves. Thank you so much for including my book in this list. May you all have a joyous…and productive…holiday season! @Paul Another nice minimalist gift is to donate to a charity in the person’s name (even better if you know what his or her favorite charity is). You are still giving a gift, but not an item to clutter up the house with. I hired the shrubs trimmed as a Christmas gift for the two of us. They had grown so high that they could only be reached by standing on a ladder. This was a job that needed to be done, and the price was well worth it not to do it ourselves.